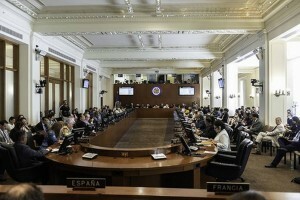 WASHINGTON - The Permanent Council of the Organization of American States (OAS) on Wednesday analyzed at a special meeting “the migration crisis” in Venezuela and, following the meeting, OAS Secretary General Luis Almagro announced the creation of a working group to analyze the migration issue, which will be chaired by exiled Venezuelan politician David Smolansky. At the meeting, the assistant executive secretary of the Inter-American Commission on Human Rights (IACHR), María Claudia Pulido, referred to the measures that the IACHR recommends as a humanitarian response to the “serious crisis that has forced the migration of thousands of Venezuelans in recent months”. “The crisis has a cross-border scope that requires a regional response based on respect for human rights. The OAS and the member states cannot remain unmoved by the many forms of suffering experienced by Venezuelans,” she said. President of the Migration Policy Institute, Andrew Seele, said that, although Venezuelan migration is not the only one in the region, it is the “most worrying” one. “We are at the beginning of the migratory flow and not at the end, there are strong reasons to believe that the Venezuelans who have left will not return any time soon to their country, and we must be prepared, since many more will leave,” he said.